Kennel Comfort Dog Training is presenting the All Things Dog Blog! This is a blog that will give you tips, tricks, and treats for dog training, dog grooming, and dog boarding. We hope you enjoy! Here are some tricks you can use for potty training your puppy! If your puppy has an accident inside, it's ok! Don't get frustrated, just clean it up and try to catch them before the next accident. Tip: Unless you caught them within four seconds of making the mess you can't give any type of correction. They won't know why you're correcting them. If you catch them in the act you can tell them "No" and give a light correction, then take them outside to finish pottying there. Teaching your dog to indicate when they have to use the bathroom can really help with older dogs! There are bells you can buy, on Amazon is where I get them, and you can hang them on your back door. The idea is the dog goes up and rings the bell when they have to potty! To do this you teach the touch command and pair it with the action of going out the door to use the bathroom. My next blog post will go through, in detail, how to teach touch and how to make the dog understand you want them to touch the bells on the door! On the left is a picture of our boxer, Roo, and pitbull, Loki. Dogs of the same pack will lay back to back in order to protect each other. It shows a vulnerability that they normally won't entrust to members outside of their homes. Roo and Loki adore each other. They sleep together, play together, will share toys and groom each other. Basically they are together 24/7 and it is really cute to see. Loki and Bear, featured on the right, are a different story. 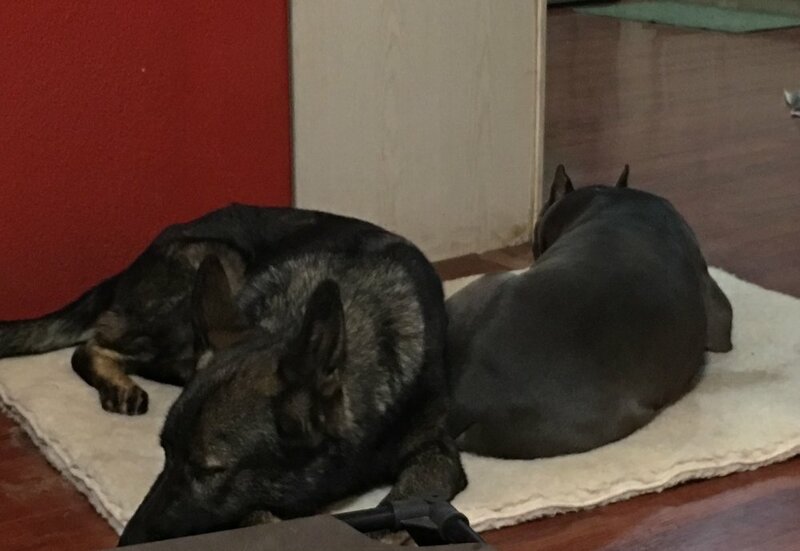 They are the only two males in our pack but they don't play together and usually have nothing to do with each other, but when told to go to the same "place" they still acknowledge that they are a pack and will protect each other. A lot of times people think dogs living in the same home have to be "best friends" and do everything together. In reality the only thing they really have to do is exist peacefully together. If they get along, great! If they choose not to interact in play together or have much to do with each other that is alright too. Dogs all have different personalities and aren't always going to like every other dog or person they meet, as long as they are polite in their interactions with those they don't care for that is all we can ask of them. I love this quote from the Zac Brown Band's Song "Chicken Fried". Boy does it ring true for me too! I've started realizing that a lot of people can connect with this concept. I left a financially secure job with a guaranteed retirement, to start my own dog training business. Trust me, it was scary. I took precautions and made sure that I was in the right place in life before quitting, but I wasn't happy in my job anymore. I was unmotivated, getting bitter, and down right miserable. Being in this state of mind wasn't helping my employer, me, or my family. I tried to fix my attitude but it seemed like every time I walked through the doors a black cloud overtook me. The sad part is, that attitude is very typical in that line of work and you're just expected to "work through it". Some do, and a few years down the road they become excited and motivated about the job again. However, I've always promised myself I wouldn't stay in a career where I was miserable, just for the paycheck. So I made a change. Luckily we had already started planning for our retirement by buying a few businesses and I soon realized that I loved working with animals and running my own businesses. Specifically, I knew I wanted to start training dogs. So my husband and I started planning, saving, and cutting down on living expenses so that I could begin transitioning away from being stuck in a job I was unhappy with for 25 more years to a new career where I can finish out my working years doing something that makes me ecstatic. Many people think that its ok to stay stuck in a job like that because they get paid good money. Or they put up with a boss or supervisor who is a jerk because of the same reason. Money is not worth your happiness or sanity. You can find good paying jobs where people treat you with respect or that you are excited about. Change can be hard but if you're stuck in a rut sometimes change is exactly the thing you may need. I am not saying to quit your job with no backup and rent due in a week. But you begin the motions. Start cutting down on living expenses. A few of the things we did was we got rid of direct TV and got Hulu instead. A $150 bill taken down to $8.99 a month. We started eating out less and making a grocery shopping list and sticking to it so there weren't unplanned items for that trip. And as a result of our cutting back, we improved our quality of life. There are many things you can do to cut costs while you search for a new career. Then, once you find, interview, and land your new position, you will feel like a million dollars putting in your two week notice to the old job. You'll get a lot of nay sayers, just as a warning. There will be a lot of people who will call you crazy to leave a steady paying position, even for another steady paying position, and some of them may be your own family members. But their opinions don't matter, your peace of mind does. Others will really surprise you with their support and excitement of your plans. Ultimately, no one will look back on their life and wish they'd worked another day in order to get more money, but they will wish they had been happier and gotten to do more things that interest them. Live your life in a way that near the end you'll have no regrets. Training your dog builds a stronger and more lasting relationship with your dog! So many people think that making their dogs follow rules will hurt that relationship but that is not what I have experienced. Giving your dog structure and rules that they are expected to follow will teach your dog discipline, impulse control, and helps them remain calm because they know exactly what is expected of them. In turn it deepens your connection with your pet because they are respecting and listening to you. You can't give your dog everything they want and expect them to be grateful for it. Making them work for their rewards through training mentally exhausts them and makes them appreciate those rewards more. As a society we've been conditioned to think that a reward for a dog is a treat, and it is! It's not the only reward you can give though. Petting them, letting them hang out in the same room as you, a toy, going on a car ride, these are all rewards for your dog and are all just as effective as a treat. It is important that you reward the behaviors that you like from your dog. It is equally important that you correct the bad behaviors or your dog will continue to do them. This is where people get worried about changing their dog too much. The nice part about training your dog is it doesn't mean you will train the personality out them. If they are a goofball before training you can bet you'll get your lovable goofball back after training. It just means they'll know when it's time to be serious and listen to commands and when it's ok to kick back and let that personality shine. You can have the benefit of a best friend who can make you smile and be proud to take them everywhere because they are so well behaved. Have that cake and eat it too! A daycare tip! Just getting out, sniffing around, laying near other dogs, and things of this nature are exhausting for any dog! There is this perception that if dogs aren't running around like mad that daycare isn't effective, and that's not true! In fact our daycare dogs are displaying the exact behaviors that are best for daycare. It's a way for them to tire themselves without having to worry ...about strange dogs getting in their face or crawling all over them. This same concept works for walks and dog parks too! Be careful with dog parks because most people don't realize their rambunctious dog can create a negative experience for your dog that can cause behavioral issues for you down the road. Just being out with you walking around is so mentally stimulating they will return home happy and relaxed! So take that pup for a walk or to a quiet park where they can sniff the flowers and roll in the grass, you'll enjoy it too!! I wanted to take some time today to tell you about my absolute favorite dog training command, place. Place has been a God send to my home because we have six dogs! We do a lot of personal rescue, where we will find a dog, bring it home, and train or care for them until they are ready to find their perfect home. So we have a lot of dogs coming in and out of our house at any given time. The place command allows you to peacefully take a shower, cook dinner, eat dinner, and do pretty much anything you need or want to do without your dog under your feet tripping you, begging for food, or anything else those mischievous rascals do :). Essentially, it's a command where they lay on a bed, towel, or whatever object you want, in a designated spot, until you let them come off of it. This command can help eliminate chewing, marking, and many other less than desirable behaviors because the dog knows that it's only job is to lay there until you say otherwise, which usually results in them falling asleep. This command is also really helpful for anxious dogs because it takes away all of the options of other things the dog could be doing, which is contributing to the anxiety! It's really important that dog training be centered around your normal, everyday life. Otherwise, eventually you'll stop doing it! No one has time to train forever, unless things like having your dog lay on their bed for hours and giving a consequence if they get off it, IS THE TRAINING! Anyone can do that! It means you can do your work, fold laundry, watch TV, all while your dog trains! Sounds good, right? I'll be the first to tell you, it's glorious. It's also amazing for your dogs because now they have structure and clear defined rules, as well as the fact that they are constantly and consistently practicing those rules, while you're not having to take a ton of time out of your day. Thanks for reading! I'll be back again with more tips, tricks and treats soon! Hi guys! I just wanted to give you a little tip for the day. Training your dog is so mentally stimulating for them that it tires them out really quick! I was working with a four month old German Shepherd puppy this morning and after about 20 minutes of training she was pooped. Training is not only a great way to tire out your dog but it really helps build your relationship. Just doing simple drills, like sit, down, come, repeat will create a stronger bond than spoiling them ever could! It is fun and stimulating for both you and them and it helps refresh your dog on their basic obedience commands, a win-win situation for everyone! Thank you for visiting my blog! My name is Lindsey Morelli and I wanted to begin writing this blog to help spread some of the knowledge I've gained over the last two years. My crazy foray into the business world began with me buying...a hair salon. Yup, everyone who knows me that ends up finding out I own a salon always does a double take. It's not my thing at all! I don't do hair, I don't wear make up, I don't dress fancy, I only get my hair cut like once a year, and yet....I found myself owning a hair salon, and LOVE it! My husband and I wanted to begin branching out from our jobs and began thinking about padding our retirement. We were heading home from our first anniversary trip and I was researching things on the internet, hit the wrong link, and up popped a website with all the current businesses being sold, for one reason or another, in Tucson! My salon had been running for ten years, successfully, and the owner was looking to retire. It was something I would be able to do, semi-absentee, while I still had my current job. Less than one month later, I owned it! I am six days away from hitting the two year mark and it's going amazingly. What does this have to do with dogs and a boarding kennel, you ask? Everything! Close to a year after buying the salon my husband and I found a dog and cat boarding kennel for sale on that same website. Now, THIS was us! Everyone who knows us knows how much we love animals, especially dogs! In May of 2015, we bought Kennel Comfort Pet Motel. I could write an insane amount of pages trying to describe how much I love our kennel, but I'll spare you :). This place had become my baby. We immersed ourselves in it and despite having other jobs and another business, devoted ourselves to it. We love our customers, their animals, our employees, and everything about it. Being a business owner was completely foreign to me but it fulfills me in a way that no other job has in quite some time. So, I would like to share everything I know about dogs, cats, and yes, business! Hopefully, you all will tune in and enjoy reading my tips, tricks, and treats of everything dog and business! I'll start with a small tip. When people discuss going into a business the first thing you always hear about is opening one. Did you know that 90% of new businesses fail within the first three years?! Crazy, right? This is straight from Forbes.com, btw. There are a few reasons businesses fail. One, people did not have a use for the service/product, just because you love the idea doesn't mean everyone will! Two, you have to have the money to keep the business going until word gets out that you're there. This can be crazy expensive. Most businesses, even small, small, small ones take $3,000 + every month to run! Three, lack of marketing. This is a huge one. Everything today is allllll about the internet. You have to be willing to not only have a website but to put yourself out there on social media. There are more but these are some of the biggest. So, if opening a new business is so perilous, what's the solution? Buy an existing business! We've done it, successfully, twice now. People move, retire, or just get burnt out operating their businesses and they come up for sale often! It's all about knowing where to look, well that, and that knowing TO look! It's not as big of a secret as you would think. You go to google, or any search engine that just happens to be my favorite, type in "businesses for sale in Tucson" or any city and you can even search the whole state of Arizona. Usually the first two websites are Bizquest and Bizbuysell. On those sites will be every business for sale in your area that are using brokers to sell. A company using a broker is more legit than those scam companies on Craigslist. The seller and owner both end up with expenses but it protects both of you during the sale. Think of it like buying a home. You're going to go through a Realtor to sell or buy a home because they are the professional who knows what all has to be done and makes sure everyone follows the laws! That will wrap up this first blog post. Check out those websites if you're interested in business and search to your heart's content! I will be back again soon and I promise there will be animal tips, tricks, and treats on here as well!